September is Gynecologic Cancer Awareness Month, a national recognition established by the Foundation for Women’s Cancer in 1999. It is estimated that this year 98,000 women will be diagnosed with a gynecologic cancer and some 30,000 will die from the disease. Gynecological Cancer Awareness Month provides an important opportunity to draw attention to this important women’s health issue and offer vital information on cancer risks, warning signs, and prevention strategies. Except for cervical cancer, for which there is the Pap Test, there are no tests or screenings to detect cancer, especially at an early stage, in other female organs. 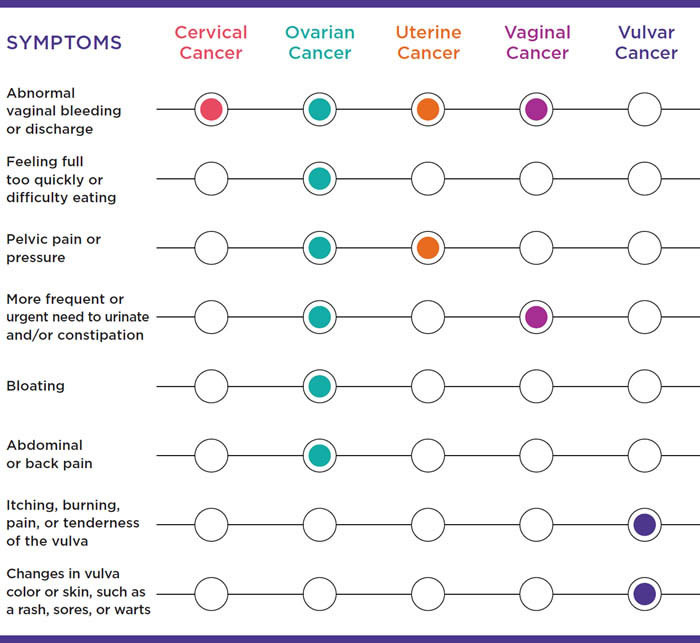 This includes ovarian cancer, uterine cancer, vaginal cancer and vulvar cancer. 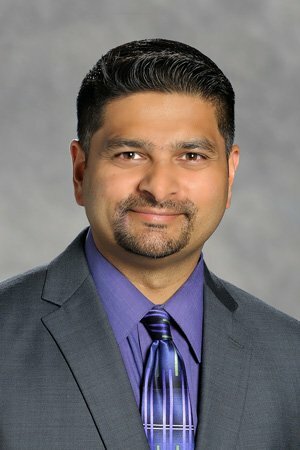 One of the best things a woman can do is to know her body extremely well and watch for any symptoms or changes, including changes or abnormalities of the skin and any abnormal vaginal bleeding and, in particular, any bleeding after menopause. The symptoms may be caused by something other than cancer, but the only way to know is to contact your doctor. 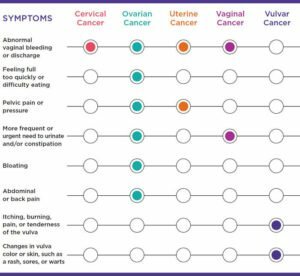 The Center for Disease Control and Prevention has created a chart that lists possible symptoms and the gynecologic cancer they are most commonly associated with. As always, your doctor is your best resource when it comes to your health, so don’t rely solely on this information. Stop smoking or don’t start. Move. Even 30 minutes of moderate activity each day can help. Eliminate stress or at least find ways to reduce stress. Know your family history. Many cancers can be hereditary, such as colon cancer. If you have a history, then you need to tell your doctor and test, if possible, for it regularly. If your relatives had cancer, they may have had a mutation (change) in their chromosomes, genes, or proteins. And that mutation can be passed along to other family members including you. For example, BRCA1 and BRCA2 are the best-known genes linked to breast cancer risk. Everyone has these genes, but some people have an inherited mutation in one or both that increases the risk of breast cancer. A consultation with a cancer genetic specialist can help you determine if you may be at risk for a gene mutation. If you are concerned about gynecologic or other types of cancer, you can call OHC at 888-649-4800 and request an appointment to discuss your concerns with one of our gynecologic cancer experts or our cancer genetic specialists. OHC has been fighting cancer on the front lines for more than three decades. We are the region’s leading experts in the treatment of nearly every form of adult cancer and complex blood disorder. OHC offers the latest medical, gynecologic and radiation therapy, and is always seeking better treatment options through participation in clinical trials. OHC is certified by the American Society for Clinical Oncology in the Quality Oncology Practice Initiative Certification Program, is an accredited Oncology Medical Home, and is one of only 179 practices nationally to be accepted into the Medicare Oncology Initiative. At its heart, our approach to cancer care is simple – to surround you with everything you need so you can focus on what matters most: beating cancer.